Hallmarked/Tested: BVLGARI. Jewels: 7 JEWELS. California Jewels travels around the United States collecting unique antique and estate jewelry, coins, watches, jade, and other fine pieces. Bvlgari ring. Condition is Pre-owned. Shipped with USPS First Class Package. T he r in g is p re o wn ed, it i s missings om e st on es. It also ha s se ve ra l ni ck s. I photographed t he different angles of the r in g, s o yo u ca n se e al l of t hi s. P le as e so photos. Features the "Bvlgari Bvlgari" engraving. Engravings BVLGARI 750 54. Colorl: Rose Gold. Style: Band. Fantastic Bvlgari / Bulgari designer italy estate ring, crafted of 18k white gold having a VS/G diamond dangle charm / B.ZERO1 collection design, completed with size reducers in band. PURITY 18K. TCW ESTIMATE (CUT, CLARITY, COLOR) APPROX. Engravings BVLGARI 750 56. Style: Band. Ring Size: 8. Fantastic Bvlgari / Bulgari designer estate bracelet, crafted of 18k white gold having a chain link / B.ZERO1 collection design, completed with a lobster claw clasp. PURITY 18K. TYPE Designer Bracelet. Condition is working, previously owned. Model number is AC 38 TA and it's serial number is L10749. Great condition, barely worn. Case: 38 mm, aluminum with black rubber bezel, black crown and push buttons, sapphire crystal. Marked: 750 / BVLGARI / Made in Italy / 54. Material: 18k Gold. Model£º 4 Band Ring. Style: Band. Style: Ring. 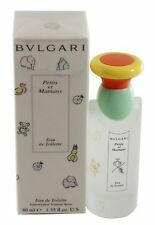 Bvlgari Pour Femme 3.4 oz. 100 ml. Made in Italy. Pre-owned. 98% full. Shipped with USPS First Class Package. IT IS WORKING PROPERLY. THERE ARE 30 TESTED BLACK DIAMONDS AROUND THE BEZEL. THIS IS AN AUTHENTIC WATCH. THERE ARE NO PAPERS OR BOX. LOW STARTING PRICE WITH NO RESERVE. Marked: 750 / BVLGARI / Made in Italy / 54. Style: Band. Style: Ring. Color: White Gold. 99%FULL,NO BOX,CONTAINS WAREHOUSING WEAR AND TEAR. Bvlgari Neucitel 0.5 Fl Oz Spray Eau De Toilette . Condition is used but still full. Looks like new, no box. Nice spray size for purse. 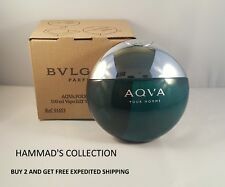 Bulgari Aqua Amara 3.4 oz Eau De Toilette 100 ml New in Box Sealed. Bulgari Aqua Amara 3.4 oz Eau De Toilette. Condition - New. Type - Eau De Toilette. BVLGARI BLACK CARBON GOLD ‘MIAMI’ WRISTWATCH. Condition is Pre-owned. Limited edition, automatic, works perfectly. Number 35/700. Band has some wear but watch is in perfect condition. In original box. Citrusy notes are combined with cactus zest which contributes to charismatic opening of the composition and highlights on the floral-spicy heart. Elegance in base notes is accentuated with Haiti vetiver Laoese benzoin and Balsa wood. Bvlgari EG40 watch which is a 40mm not the 35mm version. Bvlgari Goldea Eau de Parfum 1.7 oz. Bvlgari Goldea Eau de Parfum 1.7 oz.. Condition is Used - comes with box. A failed blind buy. Shipped with USPS First Class Package. FULL, NO BOX, BOTTLE CONTAINS SCRATCHES AND COLOR PEELING OFF, CONTAINS WAREHOUSING WEAR AND TEAR. 99%FULL, NO BOX, BOTTLE IS CHIPPED ON THE BOTTOM AND WILL BE SEALED WITH TAPE SEE PICTURES ATTACHED, NO LEAK, WAREHOUSING WEAR AND TEAR, BLEMISHES. Men Bvlgari Man Wood Essence by Bvlgari 3.4 oz EDP Spray New in Sealed Box. Condition is New. Shipped with USPS Priority Mail. For sale is an excellent condition 38mm stainless steel Bvlgari Diagono. The Diagono is fresh from factory service where is received a complete service, new crystal, case tube, and crown. The strap was not changed at service, is quite decent and has many moons of life left. GOLDEA THE ROMAN NIGHT. Eau de parfum sensuelle spray. 100 % Fresh and Authentic. You get ( 1 ) NEW - FRESH. AUTHENTIC 😀👍 ! FULL, NO BOX, NO CAP, CONTAINS WAREHOUSING WEAR AND TEAR. Bulgari Sunglasses. Black Gold Violet Gradient Bulgari Sunglasses. Bvlgari 6053 376/8D. 99% FULL, NO BOX, COLOR SLIGHTLY PEELING ON THE BOTTLE, CONTAINS WAREHOUSING WEAR AND TEAR. Bvlgari Diagono. 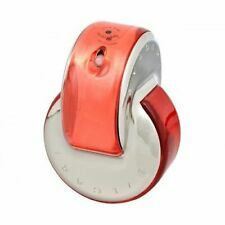 Age Group: Adult Case Size: 38 mm. Band Color: Black Caseback: Screwback Case. Case Material: Stainless Steel Year of Manufacture: 2000-2009. Case Finish: Brushed With Booklet: No. Bvlgari B.ZERO1 Ring Rose Gold Size 6,7,8,9. BVLGARI JEWELRY. PURITY 18K. Carat weights and gold values stated are approximate, this includes stones etc in the weight. TYPE Italy Designer Ring. If an identifying mark, inclusion or defect is visible in the images it is considered. Bvlgari Save The Children Bracelet. Condition is Pre-owned. Shipped with USPS First Class Package. We now the great Bvlgari Black Unisex Fragrances 2.5 fl oz. Bvlgari Serpenti Chain Shoulder Bag Pink. Condition is Pre-owned. Shipped with USPS Priority Mail. Navy blue leather. Silver hardware. Swiss made. Very light weight and low profile dress watch. Black Leather band is in nice shape with minor signs of wear. PERFECT FOR TRAVEL. AUTHENTIC. AU THE BLANC. SHAMPOO & HAIR CONDITIONER. ONE EACH, THE PRICE INCLUDES BOTH. A QUALITY PRODUCT. I try very hard to describe any flaws or problems with the things.